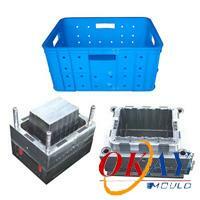 Fruit crate mold (OKAY-95) - Taizhou Huangyan Okay Mould Co.,Ltd. Fruit crate is often made of plastic crates. The features of plastic crates allow them to deliver bottles and other fragile items, fruit, for example. Shipment of bottles of water, beer, milk, and fragile items, plastic crates is designed to stack securely and reusable. Nowadays, the fruit crate is manufactured by plastic injection molding. Okay Mould is specialized in producing all kinds of molds for your end products. From designing, injecting, and manufacturing, we’ll discuss with you thoroughly. Only by doing so can we produce exact mold to meet your requirement. Other than containing fruit, our plastic crate mold also can be used for shipping bottles of water, beer, milk, and other things. If you need any detail information about our mold items, please feel free to contact us anytime.